Creativity and an original recipe using Harris Ranch Beef will help inspire more creativity for Sonoma County residents involved with the Becoming Independent Art Program. 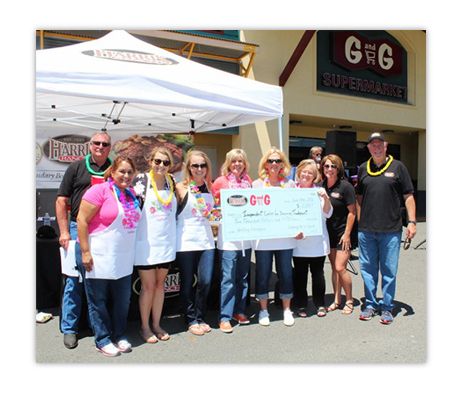 In June, Harris Ranch Beef and G&G Supermarket in Santa Rosa hosted the 2nd Annual Cooking for a Cause Grilling Challenge. Ten local teams, each representing a charity, grilled Harris Ranch beef while G&G customers tasted the creative entries and voted for their favorite. The grand prize of $2000 cash was awarded to the team “Independent Ladies for BI” for their Asian Kabob over Thai Slaw, (see recipe below). A 2nd prize of $500 in Harris Ranch Beef was awarded to Team St. Vincent De Paul, and a 3rd place prize of $250 in Harris Ranch Beef went to “B’s Family Barbeque” cooking for the Abandoned Children’s Fund. Gehrke-Minetti says the team will donate their winnings to the Becoming Independent Art Program, which provides artists with disabilities with inspiration, instruction, encouragement, and opportunity for exhibitions and sales. Originally, the Harris Ranch Cooking for a Cause competition did not include a 2nd and 3rd place prize, only the Grand Prize of $2,000. However, Brad Caudill, Vice President of Marketing for Harris Ranch Beef was so moved by the effort put out by the teams for their charities, he wanted to offer more. Cut meat in 3/4″ pieces. Mix all ingredients together and toss with cubed meat. skewer with onion, red pepper and a pieces of fresh pineapple (note do not place pineapple on the skewers until just before grilling, as it will break down the meat). Mix all ingredients together and heat just to boiling to combine flavored and let cool. Brush on meat just before grilling. Melt butter, add crushed noodles and almonds and toast. Cool. Beat peanut butter, soy sauce, lime juice, and honey until smooth. Toss coleslaw mix, basil, and cilantro with toasted noodles and almonds. Add dressing and toss again.